A device for closed wound drainage under negative pressure post operative with option to use one or two catheters simultaneously. 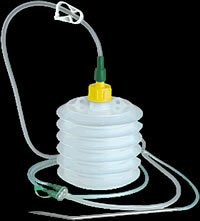 Large bellow chamber of 600ml providing long lasting suction. Radiopaque line provided to ascertain proper placement in the wound. 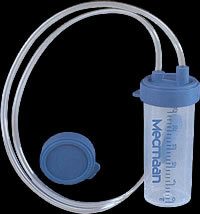 Available with curved needle of different sizes matching with catheter sizes to meet moderate to heavy drainage needs. Connecting Tube with clamp & Y" connector. Designed for drainage through Pleural & Thoracic Cavities. Catheter mounted on Trocar for easy penetration & handling. Two smooth lateral eyes for efficient drainage. Provided with markings at 5, 10 & 15 cm from the distal tip to ascertain depth of placement. Individually packed in peel off double pack. Sterile ready for use. Most suitable for post operative drainage after Cardio-Thoracic & Thoracic Surgery. Rounded open distal end with large smooth eyes to provide trauma free drainage from chest. Proximal end is fitted with specially designed tapered tongue to provide excellent forceps grip for non-traumatic insertion. With X-Ray Opaque line & markings at every 2 cm from the last eye to ascertain the depth of placement. 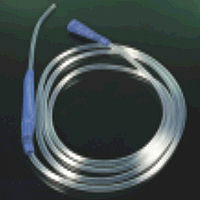 One loose connector is provided to facilitate the immediate connection of catheter with drainage set. Manufactured from non-toxic medical grade PVC material. For aspiration of secretion from oropharynx in newly born babies ensuring free respiration. Convenient for obtaining mucus specimen for microbiological examination. Clear transparent containers permits immediate visual examination of the aspirate. One lateral eye with rounded silk smooth open end for trauma free insertion. Soft kink resistant & non-toxic PVC tubing. Designed for sufficient multi-channel wound Drainage. Manufactured from extra soft medical grade, non-toxic, non-irritant PVC material to help avoid local inflammation. Suitable for removal of secretion, blood etc. Fitted with cut to fit type connector for attachment. Ribbed, soft & Kink resistant PVC tubing for unstricted flow. Tube Length : 2 mtrs.